One of the most important parts of assembling a tent is making sure that it is anchored down properly. Most product promises only apply when the unit has been fastened securely according to the instructions. 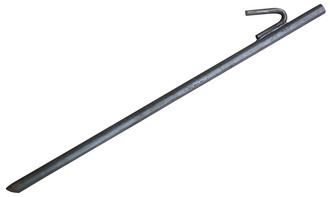 Use this Eureka 24 Inch Tent Stake with Hook to lock down your tent or canopy. The hook is 1 inch which allows for maximum rope grabbing capability. It is also probably not a bad idea to have several of these stakes on hand in case you need extras.